Earning a free membership is easy. 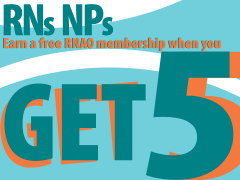 If you recruit just five RNs/NPs or new grads to join RNAO, you will receive your next RNAO membership for no charge. If you recruit one to four RNs/NPs you will receive $20 “RNAO dollars” for each RN/NP who joins. You can use these dollars toward your membership renewal or an RNAO conference registration. Keep reminding your nursing colleagues to "get 5" and reap the rewards. Be advised that new grads* can join RNAO for free and non-members who join now will receive 13 months of membership for the price of 12, making them easy recruits. Membership includes professional liability protection (PLP) as well as other exclusive membership benefits. *Those who have graduated from an undergraduate nursing program, leading to initial “RN” registration with the College of Nurses of Ontario (CNO), within the past 12 months.